We updated our list of aqua lung snorkel sets and best alternatives available in 2019. >> you can also check out our guide to best dry snorkel models here. Who Should Buy the Aqua Lung Sport Snorkel Set? LAST UPDATED: March-18-2019 : In our most recent update, we made some changes to our review of the Aqua Lung Sport Snorkel Set. As well as some major product feature tweaks, we gave our chart a little shakeup by adding the Aqua Lung Admiral Set. Aqua Lung is one of the pioneer companies in the innovation cycles of primarily scuba diving equipment. The company has outstanding snorkel sets in the market and we will be reviewing the Aqua Lung Sport Diva and Admiral sets today. Mainly, we feel like this snorkel set is best suited for beginner-intermedieate level snorkelers looking to start out their first snorkeling adventures with a complete worry-free set. The fits of these sets are true, and they have been designed to work amazingly well for sealing off the face. With the dry snorkel, you can rest assured that water will stay out of the tube, whether it’s submerged or not. Another thing snorkelers will love about this set is the fact that the trek fins pack very well and they’re also super versatile. As a bonus, the set comes with a carry bag that can hold the entire set, plus it has a little spare space for extras such as sunscreen, a rolled towel, and of course, your diving camera. We loved the fact that the snorkel tube is constructed with dry top pivot technology, which means that even when it is exposed to surface splashed; no water will enter the snorkel. The top cover pivots close and seals off whenever the tube is submerged in water, which helps to cut clearing down to a minimum. Whenever some water enters the tube, the purge valve comes in very handy to clear out any water in the tube. The Aqua Lung Snorkel Set comes with a great pair of diving fins, which can be used for swimming, snorkeling, and body-boarding fins. Since they are shorter in size than regular diving fins, the fins in this set are great for traveling purposes, and they’re also lightweight. All-in-all, these fins give incredible propulsion and power when you need it most. The mask in this snorkel set ensures that divers get a comfortable yet tight seal. With a purge valve and single lens construction, we reckon this mask comes pretty close to delivering ultimate underwater visibility. We appreciate the fact that the mask is constructed with a hypoallergenic, soft silicone skirt, but wish that the straps of the mask weren't so prone to getting stuck in our hair though. To eliminate the problem, you could just use some mask strap covers. 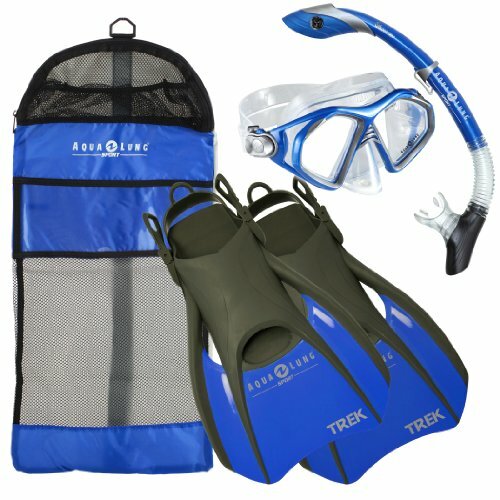 The Aqua Lung Sport Snorkel Set comes with a handy carry bag, and the quality is excellent for the set’s overall price. We found that this bag isn’t the best on the market, so if you can, go ahead and purchase an aftermarket bag that’s more versatile and a little bigger. All of the sets we recommend as alternative options come in a range of different colors and designs, but some of them sport better fins and masks that might offer you better visibility to some degree. Go ahead and try them all out before taking the leap and investing in a specific brand.